Lawrie, who only assumed Head Coach duties at Myreside at the start of the 2018/19 campaign, will work under Richard Cockerill from the summer onwards. He will continue working with Watsonians to bring on a successor. Prior to joining Watsonians, Lawrie supported Phil Smith at Heriot’s for five years, and played a key role in the Goldenacre side’s league championship win in 2015, and league and cup double the following year. 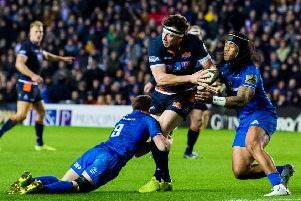 As a player, he also had a two-year spell with Doncaster and represented Scotland at Under-21 and A level before winning a senior cap against Samoa in 2013. Lawrie said: “I’m hugely excited by the opportunity to re-join Edinburgh as a member of the coaching staff and to work alongside Richard Cockerill and the rest of the on-field team. “I’d like to thank George Watson’s College, Watsonians, Heriot’s and Scottish Rugby for supporting me in my development as a coach, and my family for their endless support. I can’t wait to get started.